We can’t believe 2018 is more than halfway over! You know what they say – time flies when you’re having fun. Kissing Tree is alive and buzzing with residents, daily activities and brand new amenities around every corner. Take a look at the exciting milestones below or, better yet, come see our thriving community for yourself. 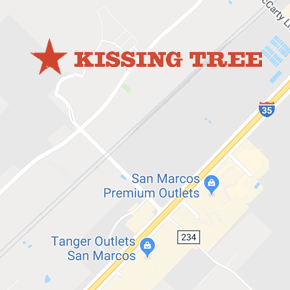 With more than 170 homes sold, the Kissing Tree family is growing every day. You can find golf cart outings, patio parties, sunset walks, wine nights and more around every corner. Explore our quick move-in homes today. Welcome to the Neighborhood, Lomita! Lomita recently joined Fair Park and Driskill. Lomita means Little Hill and it’s the perfect name for our newest Hill Country neighborhood. The area of 92 homesites is named after the historic mission in Mission, Texas. Claim your lot and enjoy the view. The Kissing Golf Course is open to residents and will open to the public in September! Do you want to be one of the first to play the newest course in Texas? Sign up for our Living Legends Golf Tournament today. With more than 100 groups and a long list of daily activities, it’s easy to meet your new neighbors and pick up old hobbies. Sharpen your pickleball skills during group play. Practice your dance moves at the weekly live music series. Kayak the San Marcos River. It’s the perfect time in your life to find new passions and enjoy all that San Marcos has to offer. See the full events schedule here. Independence Hall serves as the heart and soul of our dynamic social hub, The Mix! Enjoy Hill Country views over a cold brew, putt around on the putting course or learn a new skill in the community classroom. The Kissing Tree Food Truck will roll up for service in August! Kissing Tree Chef Kirk Doyle will serve up some of his favorite comfort food and grab-and-go snacks including nachos, battered fish tacos, homemade burgers, fresh salads and much more. Be sure to follow us on Facebook for newsworthy info and updates!